Valentin, Victoria, Bicé, Belle, and Christian are rather unusual teenagers. They live under the care of their governess, Madame Vileroy, and have just arrived in New York City where, along with their extraordinary gifts, they plan on taking the Marlowe School by storm. Valentin has the ability to turn back time, Victoria can read minds, Belle is stunningly beautiful and can influence the feelings of those around her, her twin sister Bicé can stop time, and Christian is a superb athlete. But their gifts come at a cost, and Bicé and Christian are ignorant of the deal that the others have made...but by the time they find out, will it be too late for them to extract themselves from Vileroy's grasp? Daniel and Dina Nayeri's first book has a very interesting and entertaining concept, but the slow pace will likely lose most readers before they even get halfway through. The beginning is slightly confusing. but intriguing, and the authors do an excellent job at defining the natures of each teen and painting Madame Vileroy as an enigmatic and dangerous character. At first, the insidious way in which the teens worm their ways into the lives of those at the Marlowe School is intriguing, and even a bit interesting, leaving you wondering about the ramifications. But it gets old quickly, and unfortunately lasts all the way up until the very end of the book. The character development is at times slow: Christian's development is very good, but Bicé, the only decent character, isn't given nearly as much attention as the others, and Valentin's progress is erratic. Victoria is completely stagnant and completely detestable. Overall, Another Faust is interesting at first, but the execution is too drawn out, the details on how Vileroy ultimately "bought" the teens' souls too vague and confusing, and the ending is ultimately quite unsatisfactory. Cover Comments: I really like this cover--very glamorous and intriguing! The teens are very enigmatic, which adds to the mystery of the whole package. 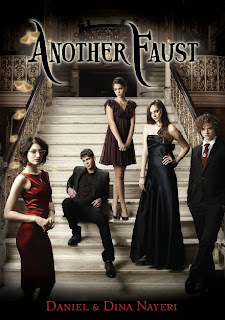 Another Faust is now available in paperback. I love this cover too. Been looking at it for a while. Very few kids have checked this book out, and I haven't really heard and raving about it. I still might pick it up someday, though. Thanks for the great review. Too bad that the libraries here in the Netherlands do not have the book or any other popular book NOW. :) I wanted to have, because it def. borrow. I saw the book in the Library of America, but do not know if I would. I had a lot of the same thoughts about this book.Thanks for the great review.I saw the book in the Library of America, but do not know if I would.